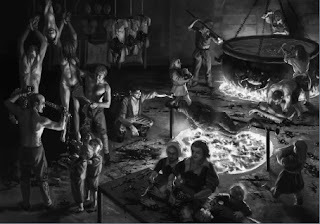 Note: This post contains some art from the LotFP adventure "Better than Any Man", which is quite gruesome. If you have a weak stomach or don't like mutilation and hideous violence being inflicted on the human person, focus on the text. This is part 3 of a continuing series about the Forsaken Ones, the Demon-Princes from the Southern Borderlands. 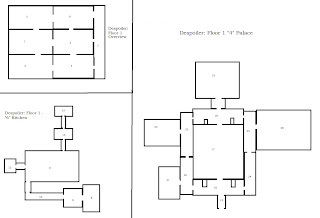 Part 1 contains the context for why the players might be exploring this Dungeon, and part 2 details the first level of the Dungeon, the basement level. 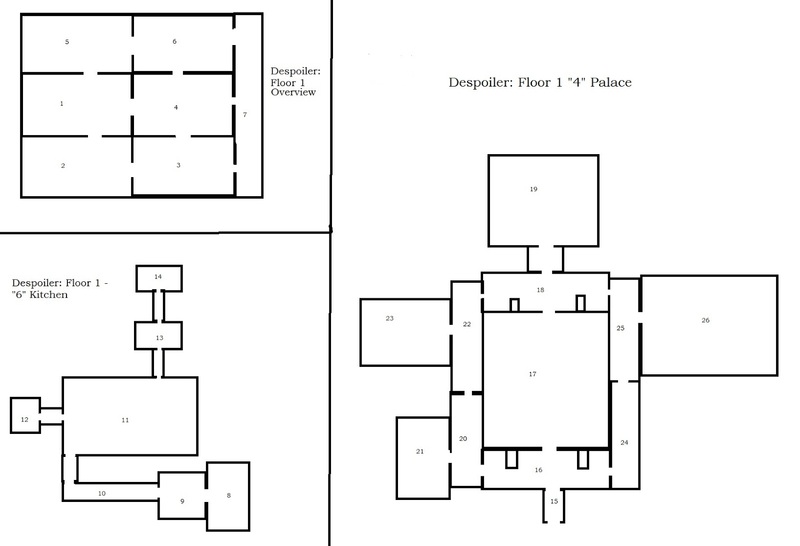 This post covers the second part of the Dungeon, the first floor. Whenever entering a new Zone on this level or new room in Zone 4 or 6, roll on the encounter table below. Whoever you meet will encounter below. 5- Algernon, Son of Russ. 1- Omens. This room or zone is empty beyond its original inhabitants, if there are any. Roll again however, and whatever that result, you hear results that indicate that, whether the scraping of the Child-Soldiers' claws, the thumping of Li'l Castain's bat, or booming footsteps for the Black Despoiler. If you roll Omens again, then you get no clue of what is next coming. 2- Foragers. These are a group of well-armed, wide-eyed human males in archaic clothing and carrying scissor blades. These are Sleepless (see statblock below) from Floor 2, coming to steal the plums of Death Delayed for their new Mistress. The leader of the fruit-theft team is named Tick, and he is wonderfully sincere and completely insane. Tick will tell you anything you want to know, but he will not help you, and if it comes to it, will sacrifice you to the Child-Soldiers so he can complete his mission of stealing the fruit. He will tell you all about the Plums of Death Delayed, the (fake) Black Fountain (though he doesn't know it's fake), the Child-Soldiers, Nanacha, the Child Mistress, and the Black Despoiler. He will not tell you where the other Sacred Treasures are or how to free the Forsaken. He will also tell you the rules, if you ask. If you depart amicably, he/they will warn you, "Watch out for Papa." Undead: As feral Undead (see below). Mad Insight: Sleepless can see through illusions, see invisible persons and objects, and see when something from the astral plane is attempting to influence reality. Sleepless: Sleepless cannot be put to sleep by magic. 3- Philosopher Eman, Son of Shavin. He is the one who tunneled out of his cell and abandoned his comrades. Eman is an Undead barely disguised as a human by a thin layer of desiccated skin and a gray robe. Eman wants to be free and get out of this prison, so he's defecting and abandoning his sacred duty. He doesn't care though. All he does know is that he's trapped up here, and before while he was just bored and miserable, now he is being hunted by thugs and killers. He's utterly petrified. Philosopher Eman is a dedicated pacificist. He will not fight, preferring to run away or use words. He is also a Cosmomancer, with the spell Transpose prepared. If you depart on amicable terms, he will warn you, "Watch out for Papa." He's not sure what it means, but everyone down here says it. Dedicated Pacificist: Philosopher's are dedicated pacificists. They would rather die than hurt someone, but they'd prefer to flee more than die. 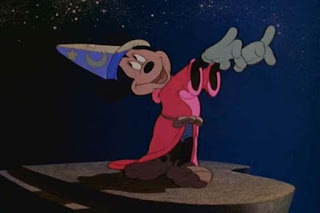 Spellcaster: The Philosophers are spellcasters. The Philosopher's spellcasting dice burn out on a "5" or "6", and he or she rolls for Chaos and Corruption as per a Wizard belong to that sub-class. The Philosopher has 3 spellcasting dice. Note: 4-9 are all Dream Ghost. Use the Statblock below 4 for all of them. 4- Amur Hopecrusher. He is an Axolotl-man, pale and thin-skinned, with big, frilly gills. He is a depressing jerk, who hates non-reptilians and non-piscine species almost as much as he hates himself. He has a powerful sceptor that blasts beams of white fire, and since the wand is magic, his Dream-Ghost could carry it with him. He will flee rather than evaporate and risk losing it. He makes attacks with his White Magick Sceptor, which can fire a white laser once per round that does 2d6 damage on a hit. Regardless of how you part, he will warn you, either with hatred on his lips or remorse on his face, "Watch out for Papa." Poppable: If Dream-Ghosts take 1 point of damage, they vanish into a puff of multi-colored smoke. This prevents them from reforming for 1d10 minutes. Logging Off: If a Dream-Ghost wishes to, it can vanish as if it took 1 point of damage as a full action. 5- Algernon, Son of Russ. He is a Human, mostly naked except for his loincloth and his crown. Refuses to let this affect his royal bearing. He enjoys many aristocratic practices, such as poetry, wrestling, and gardening. He is secretly perverted, and derives sexual pleasure from being ordered around. Algernon will avoid fighting if possible, but if he feels honor-bound to, he will challenge his opponent to a wrestling match. If you depart on amicable terms, he will warn you, "Watch out for Papa." 6- Gakrill the Mirthful. A Spiderling, made of glistening chitin covered in ornamental etchings he mostly made himself. She is very easy-going, a bit scatter brained, and doesn't want to hurt anyone. If attacked, she'll just evaporate herself. Gakrill won't fight you. Before she leaves or evaporates, she will say, "Watch out for Papa." 7- Milnay Huntress. She is a Nekomimi (looks like an anime cat-person). She is cute, eager, and high-energy. She loves to brawl and will challenge you to a fight, 1 on 1. She is hot-blooded but forgives easily. Milnay can't really fight right now, but if she is attached, she'll defend herself with her natural claws. If you part on amicable terms, she will warn you, "Watch out for Papa." 8- Nebucar of Tychis. An Orzane (a pigman) with most of his hair shaved off, leaving his pink hide exposed. He is also blind, on account of not having any eyes. He currently wears two eye patches to conceal this fact. Nebucar is cynical and jaded. He doesn't really want to talk to you, but if you insist on speaking to him, he won't do anything to stop you. He used to be a powerful Wizard, but now without his eyes, he is powerless. He will suggest that if you find them, bring them back to him, though he doubts they're still around. Secretly, if Nebucar gets his eyes back, he will become a level 1d4+2 Magic-User and go completely crazy, becoming a violent, passionate individual who show his disgust for the world by destroying it. As long as Nebucar is a Dream-Ghost he won't fight, he'll just let you kill him. Before you kill him, he will say, "Watch out for Papa." 9- Dekar Solaine. A Quarrian. He was a Prince who sacrificed himself to the Forsaken so his people might be able to have peace. His request was granted, and he was even spared from torture as he expected. He's passed the centuries in a blissful trance. Secretly, if you bring him back to Quarrian lands, you will find him to be a saint. They might not believe you have the genuine article, but if you could prove it, the reward you receive would be inconceivable. Dekar won't fight you. Before he leaves or evaporates, he will say, "Watch out for Papa." 10- Child-Soldiers. They are a group of pale, hairless creatures wearing rags, eyes burning with hate and fell power. They wear jagged claws of steel on their wrists and lope along in merry bands, creeping in silence or singing jaunty tunes. The Child-Soldiers are the children who volunteered to stay behind and guard the Despoiler, to prevent him from ever escaping. Most of them harbored a deep hatred for him, as he was the one who had killed their parents. Or at least, they blamed him their parent's deaths. Over time though, they realized three things. First, they had grown to love the Despoiler as a replacement father, even calling him "Papa". Secondly, they realized they could not kill Papa, even if they tried. Thirdly, they loved killing. So now they wander the halls of this level, hunting anyone they know isn't supposed to be here. Other tomb-robbers and Adventurers have come this way, but none have ever made it past the Child-Soldiers. The Child-Soldiers kill anyone they can, traveling in groups of four, seeking out noise. If you manage to kill them, they will whisper with their dying breath, "What out for Papa." Note: There are only 30 Child-Soldiers on this level, counting the 6 in the Feast Hall, "23" and not counting Li'L Castain, because while he is one of them, he has his own statblock. Undead: Child-Soldiers are Undead. They have all the properties of a feral Undead (see below). 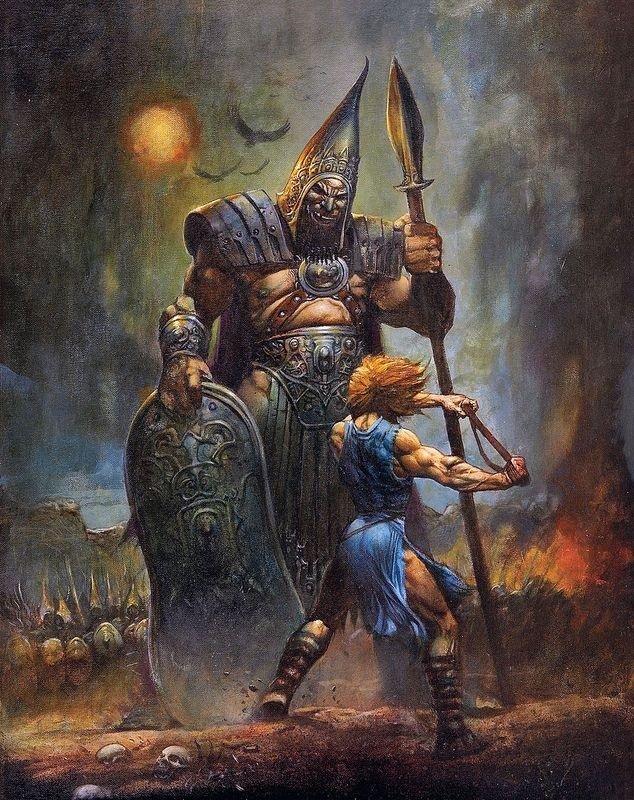 Refuses to Die: If a Child-Soldier would be knocked below 1 HP by any source of damage, there is a 50% chance that they could instead ignore that damage, and survive at 1 HP. Delayed Damage: If a Child-Soldier takes damage, it does not count that damage it has taken until 1 round later, on the next turn of the person who dealt it damage. Weakness: Child-Soldiers will not take violent actions in the presence of the Black Despoiler. They love him too much. Also, if he saw them being violent, he would kill them. 11- Li'L Castain. Li'L Castain is the leader of the Child-Soldiers. He is larger and stronger than the normal ones, acting as a big brother to Nanacha's disapproving big-sister. Unlike Nanacha, who disapproves of this violence, Castain encourages it, leading many hunts himself. He stalks the halls with a small bodyguard of four Child-Soldiers, carrying a metal rod that he uses to beat anyone he finds to death. Weakness: Castain has the weaknesses of a normal Child-Soldier, but he also possesses an additional one. He cannot just crush someone. He is methodical and obsessed with high-drama and chivalric folklore, so he cannot just kill you. He has to drag everything out, so he can monologue, grand-stand, and do other dramatic things. He will also run away, unlike most of the Child-Soldiers. If forced to run away, he will warn you, "Watch out for Papa." Child-Soldier: Li'L Castain has all the abilities and weaknesses of a Child-Soldier (see above). 12- The Black Despoiler. He is an absolute monster, a mountain of bone and muscle, 10 feet tall at the shoulder, with arms as broad as your torso. He is wrapped in an enormous amount of steel and carries no weapon but for a small knife, though it resembles a longsword to someone like you. His face is mostly concealed behind a helm, but of what you can see, it's clear he has a face only a mother could love. His eyes are the worst part though, both completely black, with no sclera or iris, just voids of darkness. Looking into those soulless eyes of his turns the knees to jelly and makes people break out into cold sweats. This is the Black Despoiler. His name is unknown to you. He can speak any language you can, though he's unlikely to. He'll ignore you if you make yourself scarce and he can pretend he didn't see you. If you insist on sticking around, he'll try to kill you, but in an uncommitted way. Most of the time, when killing, he acts as if he's trying to swat a particularly annoying fly. But if you try and fight him, or if you manage to hurt him, he'll get serious, and then you'll be dead for sure. 1: The Black Despoiler has a set of manacles, the chain between them broken, around his ankles. He cannot physically leave this floor (ground level) until the shackles are unlocked. The key is hidden, and it is the only way to open the manacles. 2: The Black Despoiler cannot bring himself to hurt someone who might be innocent. He will not hurt children, maidens or simple folk. However, he has no sympathy for murderers, promiscuous women, and Magic-Users. He will kill the others on sight, once he has confirmed their identities. He is currently looking for Eman, Son of Shavin for the last reason, as he saw Eman cast a spell. 3: The Black Despoiler hates Nanacha, and will avoid her. If he must go into a room where she is, he will pretend she isn't there. Pointing her out or asking him why will prompt an angry murder attempt. If you attempt to fight the Black Despoiler, you will find he is an Outsider, possessing all the usual abilities of one, with a Damage Threshold of 7, an AC of 11, saves of "14 or less is a success", and makes three attacks, usually with his bare hands, each dealing 1d6+4 damage. He has a STR of 19(+4), as well as the ability to turn his skin as hard as steel and make himself intangible to non-spiritual objects, though during this time he cannot affect non-spiritual objects. Referee's Note: The "Outside" Zones aren't actually outside, as the Forsaken's Palace is surrounded by a pyramid made of enchanted gray stone that extends up to the second floor, blocking off access to the open sky. For more information on what the wall is like it was what touching it will do to you, see Zone 7 below. The escape tunnel from the basement level, "20" comes up here. This is a walled space, with a floor of hard-packed dirt and high walls of barren stone. The bottom inside of the walls are covered in scratches and pitmarks, as dozens tried to climb the sheer, smooth walls and failed. You will find corpses all over this place, all of them reduced to skeletons, though many still bear the signs of their violent deaths. You will also find a dozen metal crosses arranged in a circle in the center of the "garden", each one having a semi-rotten corpse attached to it. Further inspection will reveal that these corpses were tattooed with magical runes of preservation and animation, to keep them from rotting to nothing. These corpses are all Undead- if spoken to, they will sing the praises of the Forsaken in long-dead tongues. If you manage to be able to communicate with them, they will ask to be unchained, so that they may seek salvation. If you let them down, they will thank you profusely, then do their best to kill you. They want to die, that is their only motivation. Undead: These creatures are Undead. They do not get tired, feel pain, are immune to poisons, or feel fear. Sunlight Vulnerability: These Undead, if in sunlight, take 1d6 damage a round. Hard to Kill: Unless decapitated, burnt to ashes, or reduced to 0 HP by a magical attack or weapon, these Undead have an X-in-6 chance of returning to life, where X is equal to their HD. This is a garden of empty flower beds and dead grasses with two major features. First, there is a large fountain made of ornately carved blocks of black stone. The water inside it is a pale, rose-pink, and smells faintly of blood. If you drink some of the water from this fountain, you de-age to the size of a child for 1d10+1d6 minutes. After the time is up however, you change back. The second feature is the tree. The tree is growing roughly opposite of the fountain, sheltering half the empty garden from non-accessible sunlight is a great tree. The Tree is made of dark brown, almost black wood, and reeks faintly of almonds. Its leaves are faded gold and copper, with many of them piled up around the base of the tree or covering the ground around it. If you walk across these leaves, you will feel the ground underneath it move, as if you are not walking on stable ground. You aren't. If you dig back the leaves, you will find the ground beneath the tree is carpeted in bones and skulls. Hanging from the tree's branches are small, dark-red fruits. They have an intoxicating, overpowering smell when sniffed up-close, with an odor similar to shoving your nose in a glass of straight gin and taking a big whiff. Additionally, just touching the fruit is enough to irritate exposed skin that touches the fruit. It raises goosebumps across your entire body. Every instinct you have is warning you, saying, "Do not eat this fruit." Anyone who eats one of these dark red fruits falls into a deep sleep and dies, no save. These are the Plums of Death Delayed. The third thing in this room is the Child Mistress, Girl-Wonder, Starcounter, Nanacha, Daughter of Vollar. Nanacha is a small, eight-year old girl, a hungry, thirsty and sad child who just happens to be smarter and older than any other mortal alive today. For unlike all the others in this Palace, besides the Forsaken, Nanacha is alive. She is actually immortal, though she won't reveal this to you. Nanacha will talk to you if you come by, and she will prove to be an eager conversation partner. She will ask you many questions about the state of the world, who you are, why you are here, and etc. She will also warn you that you should leave, for the Despoiler is roaming this area, and if he catches you, he will kill you. He cannot leave this level though, she will say, so if you leave, he won't be able to follow you. This is correct information. Nanacha will not lie, but she will avoid certain topics. She will not tell you about the Sacred Treasures, about where the Black Fountain is, or how to free the Forsaken. Weakness: Nanacha is riddled with self-hatred. The one person she ever loved, she betrayed. She knows he was evil, but she still regrets it. He hates her and she deserves every drop of his venom. She wants to abandon her sacred duty, to end her eternity of isolation and self-loathing, but she can't bring herself to do that either. Regeneration: Nanacha regenerates at a rate of 1 HP a minute. She can also regrow limbs and even her whole body, but the former would take hours and exhaust her, and the latter would take weeks. Conditional Immortality: Nanacha cannot die unless someone drains her blood and drinks it, accepting the power of the Black Fountain into themselves. If anyone does that, they will gain her immortality. This garden is the only proper one. It is full of sunlight, brilliant in comparison to all the other rooms, which are shrouded in darkness. It is full of flowers and wind-chimes, with short walls draped in ivy and honeysuckle blossoms. The one thing out of place is the headless skeleton of bleached bone slumped up against a short, stone wall. The skull, which once belonged to a child, has been cleaned and set atop a small boulder, a crown of flowers placed on its head. The Despoiler occasionally stops by to pray to the Child's skull, and ask for forgiveness. The Despoiler comes here to garden, to be rid of the Children, and to meditate to calm his wounded mind. If you come in here and start trying to disturb him, he will react poorly. If you come in here and start ripping up flowers or damaging his garden, he will kill you, no matter what. The sunlight illuminating this place comes from the Shield of the Sun, a massive square shield made of hammered, gilded bronze that can emit natural sunlight as a full action for up to 10 minutes a day, before it needs to be recharged with real sunlight. It is a magical item, but it is so heavy you must have a STR of 16 or higher to use and carry it as a shield. A combined STR of 16 is more than enough to carry it, but not to use as a weapon. This garden also has a walkway leading up to a pair of glass french doors that lead to "26". Note: The Despoiler has been having some of the Sleepless upstairs bring him sunlight in exchange for the fruits of the Tree of Peace and Grave. See below in the Zone 4 section. This is a large garden with stone walkways riding through ponds of still water and beds of artfully raked gravel, still undisturbed after all this time. There is an elevated stone platform in the center with a flat top, well worn by many years of padding feet. The only real item of interest in this area is the giant mirror. There is a giant mirror set in the corner of the garden, a curtain of reflective glass. Anyone who approaches the mirror and peers into it will see themselves, of course. But as they watch themselves, their reflection will begin changing, getting stronger, handsomer, or generally better. The reflection will improve with the character's desire, so ask the players what their characters really want to be true about themselves. If they say "Stronger" then the character's reflection starts growing rippling muscles. All answers will be accepted here. If the character's secret desire is that they wish they were born a woman or were actually a half-goblin half-slime merchant, then that is what they will see. However, as their reflections are changing, suddenly the character's reflections will see something unseen and begin panicking, moving independently of the character, as if the characters were watching duplicates of themselves through one-way glass. The reflections will then be "killed" and dragged off by this unseen force in timely fashion, and the character will not be able to see their reflection in the mirror ever again. This has no lasting effect, though the Referee should pretend like it did. Other than this effect, the mirror is as breakable as any other mirror, though it is priceless in any medieval or pre-Medieval setting, though transporting it is likely impossible. See below in the Zone 6 section. This is a small sliver of dirt that was encapsulated by the pyramid. There is nothing here except for a chance to huddle up next to the walls of the Warded Walls of the Pyramid. The Pyramid itself covers the top three stories of the Forsaken's Palace, and is made of ugly, grey limestone etched with thousands of magic runes that still shimmer with power. These runes include but are not limited to, "Pain", "Fear", "Suffering", "Death", "Repel Higher Being" and "Obliterate". To even approach the pyramid's walls requires a strong will, as the magical radiation it exudes is enough to make your every hair stand on end and every instinct you possess scream at you to run as far away from this thing as you can, as it is clearly dangerous, sending the same signals a Dragon's presence would to your Lizard brain. But if you manage to ignore your instincts and touch the wall, roll 1d6 below and add +1 to your roll for each time you've previously touched the wall. What happens when I touch the clearly dangerous enchanted barrier? 1- Fear. A terrible monster slithers out of a glyph on the wall and tries to attack you. The monster is a hallucination. 2- Pain. Your body is wracked by terrible pain. You take 1d6 WIS damage, no save. 3- Fire. You burst into flames. You take 1d6 damage a round until you take an action to smother or extinguish the flames. 4- Ice. You are blasted by ice. You take 2d6 ice damage and must save. On a failure, you are trapped by a thin layer of ice and you will need to be chipped out of the icy shell. 5- Repulsion. You are thrown backwards. You take 1d6 damage from hitting the wall behind you, save for half. Anyone hit by you being blasted backwards also takes damage as you did, save for half. 6- Hideous Suffering. You take 3d6 damage as corrupting magical energy surges through your body, electrifying your body and filling your mind with hideous, incomprehensible visions. 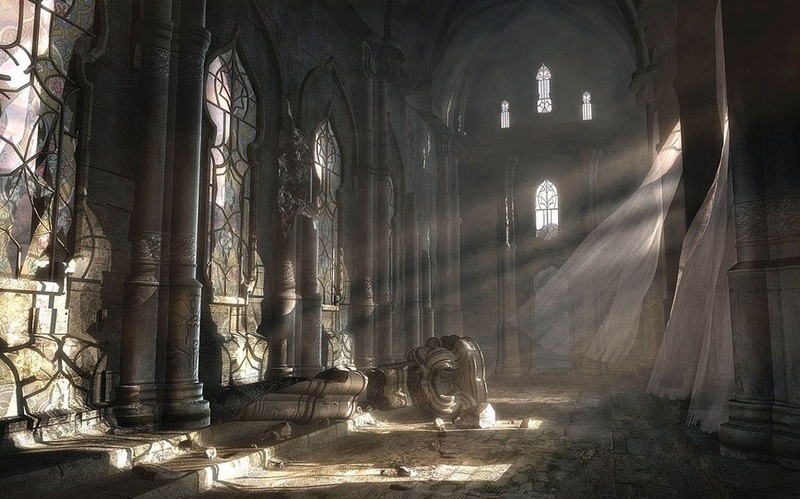 Anyone killed by this reanimates as an Undead 1d6 minutes later, who is forever bound to this place until the Forsaken are destroyed or this Palace and the Pyramid around it are razed to the ground. 7+- As "6" but add +1d6 damage for every digit higher than six. For example, at a result of "7", touching the wall does 4d6 damage, "8" does 5d6 damage, and etc. Additionally, if any Forsaken touches this wall, count their rolls as if they had already touched the walls 5 times. Note: The whole kitchen is actually a trap set by a bunch of Undead to entrap foolish tomb-robbers, to lure them here and kill them. Thus, if the players trigger anything, it sets off the mouse-trap contraption of the entire Zone, awakening all the Undead and unleashing everything. The door to the kitchen is flimsy, made of barely together wood. Touch it lightly and it falls inside. Besides the door and in the interior of this room, someone has written "The Black Fountain is Here", "Eternal Life to the Victor", and "Save Us". This all looks like it was written in blood. This room is full of bone-dry sinks and a pair of skeletons in ancient, threadbare dresses. The skeletons are laying on the ground, dead and unmoving. If you cast any form of 'Detect Magic' or some spell like that though, you will find these skeletons are undead, they are just lying down, pretending to be normal corpses. They aren't actually sleeping though, just waiting for the signal. Once the Trap is Sprung: The sinks begin to fill with hot blood and steam fills the room. The two scullery maids will get off the ground and attempt to stop you from getting past them, out the door. The scullery maids use the feral Undead statblock at the top of this post, in Zone 1. This is a long hallway, with several ancient barrels of wine stacked in the far corner. The wine could be very valuable, or it could be worthless. Once the Trap is Sprung: The wine barrels burst open and spectral vines reach out to ensnare anyone who is near it. These vines then seek to drag anyone ensnared into the kitchen. These vines use the Phantom Vine statblock, see below. Vine Puncture: The Phantom Vine impales anyone pierced by its vines, and as an action, can do an additional 1d6 damage to them. This produces dark red grapes that grow along its spectral lengths. If anyone eats these grapes, they regain 1d6+1 HP. The person stabbed knows this, as they can feel the Phantom Vine plundering their vitality and storing it in these grapes. Ghost: The Phantom Vine is a Ghost. Along with being Undead, it can also fly. It could also turn itself intangible, but as this is just a Plant's Ghost, it is too stupid to do that. Sunlight Damage: The Phantom Vine takes the max damage possible from sunlight if exposed to it. This is an impressive kitchen, with a massive fireplace that takes up an entire wall, a huge stone hearth, and several counters for work area. There are a pair of skeletons in chefs outfits in here, one slumped over the counter, the other sprawled in front of the hearth, which is full of nothing but cold ash now. Once the Trap is Sprung: The fireplace is suddenly alight with ghostly green fire and the chefs get up and start sharpening their knives. They will try to drag you into this room and throw you into the fire. The chefs use the feral Undead statblock at the top of this post, in Zone 1. This small room houses the other side the dumbwaiter reached in the Basement. Room "17" in the Red Tormentor's area. If the players climbed up the dumbwaiter, they came out here. This is a place full of bones and blood-stained knives. This whole place looks like it was abandoned mid-work, so fast that the chefs just dropped what they were doing and ran, leaving their work behind. This is a dark room with stiff, stone walls and a thick curtain of canvas to separate this space. Inside you will find the bones of some animals littering the ground and some hooks hanging from the wall, but that is it. There is also a large hole in the center of the floor where hot coals would be poured so the heat would rise up, filling the air with smoke. Of course, not it is cold. Also, on a rack slightly off to the side but still clearly visible, there is a large, gilded goblet of iron, embossed with scenes of war and glory, of single warriors fighting impossible battles against hundreds of foes. The goblet is also decorated with a pair of skulls, each one with rubies in its eyes. The goblet is magic as well. If you take the goblet, this triggers the trap. Once the Trap is Sprung: The hole in the ground flares with fire, and choking smoke fills the room. The Smokehouse Ghost appears and tries to either chase those in his smokehouse into the kitchen, so they can be burnt alive, or drag them back into the fire with him, where they can burn with him, forever. The Smokehouse Ghost's statblock is below. Chain: The Smokehouse Ghost wields a pair of flaming chains. Anyone hit by one takes 1d6 damage from the hit and an additional 1d6 fire. They continue taking this fire damage each round. They are also grappled, unless that person has a shield, in which case they can save to avoid being grappled but risk losing their shield. The Smokehouse Ghost can grapple up to two people at once. Fearless: The Smokehouse Ghost does not check morale unless he is threatened with total destruction or sunlight. Then he will dive back into the fire pit and disappear until the sunlight goes away. Conditional Immortality: The Smokehouse Ghost will continue being alive as long as the iron goblet is intact, he will continue to be alive. But if it is destroyed or bathed in purifying, holy fire, he is dead for good. Ghost: The Smokehouse Ghost is a Ghost. Along with being Undead, he can also fly and turn himself intangible, so non-spiritual objects pass through him. When intangible he is immune to non-magical damage, but can only affect spiritual objects. Sunlight Damage: The Smokehouse Ghost takes the max damage possible from sunlight if exposed to it. - Drag them to the Main Kitchen, "11"
The entrance to the palace. There was a massive set of double doors here, made of bronze and engraved with thousands of intricate designs. The doors aren't there anymore though, instead laying off to the side because they looked like they were torn off their hinges by something incredibly strong. Once you pass through "15", you will find yourself in a long hallway with vaulted ceilings and elaborate tile-work beneath your feet. Two staircases with carved banisters stand to your left and right, and there are open doors on the left, leading to "20" and right walls, leading to "24" a pair of opulently appointed hallways. Meanwhile, directly before you, there is an open passageway leading directly to "17", a large, mostly empty courtyard. There is also a large, beautiful tapestry hanging over this entrance, though it is large enough that you can see the details from the ground. The tapestry depicts four tall, powerful beings, entering a city on foot. These figures are as tall standing as men on horseback, as some calvary are included for scale, and each one is beautiful and glorious. One of these enormous figures is clad in black armor, holding a glittering silver spear and an onyx shield, he stands at the front, being greeted by a throng of children draped in flowers. The others behind are less detailed, but still clearly impressive. The next two figures are women, one is clearly the Red Tormentor, dressed in studded armor that is wrapped around her spiky, spiny body. The female figure behind her has her face hidden, along with most of her body beneath a cloth-of-gold robe. The last figure is the least significant looking, wearing a cape of royal purple and a cruel smile on his face. He also seems to only possess one eye. The tapestry is a beautiful work of art, and would be worth a princely sum undamaged. Getting it down from where it was hung without destroying it utterly would be difficult though. This courtyard is covered in cobblestones with several large, raised beds of soil, where trees and plants were planted. By now though, all the plants have been ripped up and left strewn across the ground, and all the trees have died and been cut down, so only a few ragged stumps remain. Also, looking at the stumps, a few of them look like the trees were snapped off, not cut with an axe. There are only two exits from this room, one leading back to "16" and the other to "18"
This hall has two staircases leading up on either side of the entrance from "17". On the walls there are also open doors leading to "22" on the left and "25" on the right. Before you is also an intricately tooled set of massive doors, covered in gold leaf. These are unlocked, and lead to "19". Besides that, along the same wall, there are a series of small tables, each displaying a rare treasure or trinket. Roll 1d8 below to see what treasures are on display. There are also small plaques next to each one, written in a language the players might not be able to read. See the description below to see what the plaque says. 1- 1d20 Teapots. Each one is hand-painted and beautiful. Very delicate and fragile, but quite beautiful. Plaque reads "400 Hand-painted Tea Pots, a gift from the Sultan of Byuwana, wishing you good health and sharp drink." Each teapot is worth 1d100 silver. 2- 1d10 pieces of Scrimshaw Jewelry. Carved whalebone, made into charms, blades or other decorative pieces. Plaque reads "100 pieces of fine scrimshaw, a gift from the Corsair King, wishing you honor and glory in all your exploits." Each piece of scrimshaw is worht 1d20+10 silver. 3- Bloodbane. A sword made of white metal that is surprisingly heavy. It is magical. The Plaque reads "The Sword Bloodbane, enemy of mortals, cholerics, and fools, a gift from the Desperado Desix Four-Fingers, wishing you long life and good fortune." Bloodbane is a magical sword that has the power that, if it wounds someone, it causes its next attack to do +1 damage. This stacks each time a successful attack is made. However, once you start accruing a damage bonus, you will become possessed by Bloodbane's cursed nature, and must succeed a saving throw to stop fighting, with a penalty to your save equal to the damage bonus. While you have not passed a successful saving throw, you must attack a target each turn or you take damage equal to Bloodbane's current damage bonus. 4- 1d6 Seeds. The seeds are large, but don't look particularly impressive. They are subtly magic, but nothing else about them stands out. The Plaque reads, "A collection of seeds from my Garden, a gift from Oberon, Father of Spring and King of the Folk*, wishing you bloody battles and fine women." Each seed is actually powerfully magical, and if planted and nutured, will grow a magical plant. You can make up whatever magical plants you want to, but I would have them grow a piece of sugarcane that reaches up into the Heavens, a talking strawberry bush, or a tree that produces peaches that extend life and heal injuries. 5- A Jasper Crown. A fine crown carved of clear jasper. Clear as crystal and refracts light like a prism, surrounding the wearer's head with rainbows and a shining glow. The Plaque reads, "A crown of clear crystal, a gift from the Prince of Vottis, wishing you good judgement and keen eyes." The crown is worth 1d100*1d10 silver. 6- A Tigerskin Cape. A finely tailored cape of tigerskin. Warm and aristocratic. The Plaque reads, "A cape worthy of your majesty, a gift from the Governor-General of the Grand Court, wishing you peace and safety in these difficult times." The cape is worth 1d20*10 silver. It's also quite dashing. 7- 1d8 Zebra-hides. The Plaque reads, "100 Zebra-hides, a gift from Prince of Parties, Lalatino Petal, wishing you worth and comfort." Each Zebra-hide is worth 1d20+1d6 silver. 8- A hairnet of steel wire and lapis lazuli. The Plaque reads, "A hairnet made for a female with tough to manage hair, a gift from the King of Lyccica, wishing you able heralds and honorable guests." This is the largest room you've yet seen, with cathedral-like ceilings that stretch incredibly high, the floors covered in mosaics of victory, the walls covered in symbols of kingship. There is a large dais set against the back wall, which is set underneath a massive window. The walls of the pyramid do not cover this window, so this room is bathed in sunlight during the day as it shines through the massive window. Set upon the throne is a massive throne of oily, black crystal. It looks very intimidating, but is non-magical. The only thing odd about it is its size, as it was clearly made for something much larger than a human. If you sit upon this throne, you will feel too high off the ground, and probably vaguely silly, as it is far too large for you. However, almost immediately, you will feel his eye upon you. The Black Despoiler can sense when people sit upon his throne, and will come to investigate to see who is meddling with his furniture. There are also two other pieces of furniture in this room. The first is a couch set against the side wall, halfway between the dais and the door. This couch is made of teakwood, wrapped in bundles of thick, bristly cloth, like a strange combination between a scratching post and a fainting couch. This is the Red Tormentor's couch. If she is still in her office, she will ignore you sitting on her couch, but if she has abandoned her pacifism, she will come to try and find out who is meddling with her favorite place to sit. The second piece of furniture is a voluminous yellow cushion set adjacent to the throne, fluffy, soft and sweet-smelling. Anyone who lays down on this will be amazed by how comfortable it is and will have to resist the immediate desire to drift off into a restful sleep. Anyone who does will immediately begin dreaming, and projecting a Dream-Ghost as one of the Dreaming Dead in "22". They will also summon the Yellow Dreamer's Dream-Ghost from the third floor to come investigate who is napping on her cushion. Finally, if anyone sits down on the steps leading up to the throne, the One-Eyed Man will become aware of their location. If you turned left in "16", you enter this hall. You see two doors in this hall, one to your left, leading to "21", the other straight ahead, leading to "22". This hall is adorned with stone tablets hung along the wall, some covered in moth-eaten curtains, others exposed to plain. The uncovered tablets detail certain historical events in your setting in prophetic form. For example, for my setting, I would include the Human-Dwarven Wars, the Rise of the Orzanian Empire, the Collapse of the Frog Cult, etc. All of these uncovered tablets also include little plagues next to them marking out dates, indicating that these events were predicted years, decades or even centuries prior to them happening. The covered tablets, on the other hand, are draped in cloth to prevent them from being seen, and that cloth is tied in place with a ribbon sealed with a clay tag, each one describing a type of person in a modern tongue the players can understand, assuming they're not all unlettered savages. These descriptions of people include such things as a prostitute, warrior, prince, magistrate, slave, hero or adventurer, whatever you decide. If the players decide to open up any of these curtains and look at the tablets, give them a prophecy tailored to them, or just roll on the table below. What did the Seer prophesy? 1- You are going to die soon. Congratulations! 2- Your wife is an adulteress. At least half of the children she bears for you will spring from another man's seed. You have my sympathies. 3- You are going to get married to a monster that even the gods fear. Good luck with that. 4- You are going to embarrass yourself in front of your family. I'll try not to laugh, but your Father's expression is just too good. 5- Your friends are laughing behind your back. Kill them. 6- People tell you you are an exciting and wonderful person. You know they're lying. If I were you I'd bar my doors and never leave my house ever again. A small sitting room meant for informal meetings with one of the Forsaken. The walls of this room are paneled with rotting wood and the floor is dusted in dirt and scum. There is an elegant chair set near the rear wall on a small dais, built for a creature much larger than any man. There is also an Undead nailed to the wall. It is one of the Sleepless. His name is Clovis, and he is highly insane, very talkative, and helpful (for now at least). His legs have been amputated below the knee and he's currently nailed, upside down, to the wall, but that doesn't seem to bother him much. Clovis will try to get you to let him down and if you're feeling generous, carrying him up to the third floor. He will warn you about the Child-Soldiers, and tell you how it works with them. What the rules are, so to speak. If you could help him find his legs, that would be great as well. This hall has three doors, one to the south leads to "20", one to the left that leads to "23" and one to the right that leads to "18". There are six glass coffins in this hall, each one housing a different person. If you have a warden-level access pass, you can individually or collectively unlock all the coffins, and release those trapped in stasis inside. If you can't manage that, you could try to smash them open. Who does this Coffin House? 1- Amur Hopecrusher. He is an Axolotl-man, pale and thin-skinned, with big, frilly gills. He is a depressing jerk, who hates non-reptilians and non-piscine species almost as much as he hates himself. He has a powerful sceptor that blasts beams of white fire, and since the wand is magic, his Dream-Ghost could carry it with him. He will flee rather than evaporate and risk losing it. 2- Algernon, Son of Russ. He is a Human, mostly naked except for his loincloth and his crown. Refuses to let this affect his royal bearing. He enjoys many aristocratic practices, such as poetry, wrestling, and gardening. He is secretly perverted, and derives sexual pleasure from being ordered around. 3- Gakrill the Mirthful. A Spiderling, made of glistening chitin covered in ornamental etchings he mostly made himself. She is very easy-going, a bit scatter brained, and doesn't want to hurt anyone. If attacked, she'll just evaporate herself. 4- Milnay Huntress. She is a Nekomimi (looks like an anime cat-person). She is cute, eager, and high-energy. She loves to brawl and will challenge you to a fight, 1 on 1. She is hot-blooded but forgives easily. 5- Nebucar of Tychis. An Orzane (a pigman) with most of his hair shaved off, leaving his pink hide exposed. He is also blind, on account of not having any eyes. He currently wears two eye patches to conceal this fact. Nebucar is cynical and jaded. He doesn't really want to talk to you, but if you insist on speaking to him, he won't do anything to stop you. He used to be a powerful Wizard, but now without his eyes, he is powerless. He will suggest that if you find them, bring them back to him, though he doubts they're still around. Secretly, if Nebucar gets his eyes back, he will become a level 1d4+2 Magic-User and go completely crazy, becoming a violent, passionate individual who show his disgust for the world by destroying it. 6- Dekar Solaine. A Quarrian. He was a Prince who sacrificied himself to the Forsaken so his people might be able to have peace. His request was granted, and he was even spared from torture as he expected. He's passed the centuries in a blissful trance. Secretly, if you bring him back to Quarrian lands, you will find him to be a saint. They might not believe you have the genuine article, but if you can prove it, the reward you receive would be inconceivable. This is an ancient dining hall, with a massive fireplace at the far end and huge set of doors leading to it. Somehow, these doors have survived destruction. However, this room has been somewhat fortified, with all the furniture within having been used to build a line of wooden barricades across the room and the rest made into pile after pile of wooden stakes. There will be 6 Child-Soldiers in here, waiting for their brethren to return. This hall has two doors, one near the end on the left-hand side, leading to "24". The other is straight ahead, leading to "25". This hall is decorated with sets of painted wooden shutters, hung every so often along the walls. If you look at the shutter from the outside, you see a portrait of some kind of person. If you then open the shutter, you can see what happened to them on the inside. What happened to this poor person? 1- Outside: An absolutely beautiful human male with long, blonde hair. Inside: That man being flayed alive with red hot knives. 2- Outside: A Dwarf, black-skinned with dark hair, horns and flowers growing from its scalp. Inside: That same Dwarf in a cage, with its limbs forced outside the cage, being dangled over a pool of crocodiles. 3- Outside: A pair of Quarrian girls, both beautiful and strikingly similar. Anyone with experience with Quarrians will tell you that they are twins. Inside: A series of engravings revealing the two being locked in a cell, slowly turning on each other, running out of food, then one beating the other to death and eating her. 4- Outside: A Handsome Man, stunning in his appearance, with rosy eyes and a pair of stunning eyes that captivate anyone who sees the painting. Inside: A series of sketches depicting the Handsome Man slowly starving to death. Reading the dates underneath the sketches will reveal this took almost a month and a half. 5- Outside: A family of Lizarians, a patriarch, a female, and their three children. An absolutely picturesque scene. Inside: A stunningly gruesome painting that depicts the patriarch nailed to a dinner table, slowly being carved apart and served to the people seated around him. The Red Tormentor is hosting this meal, and she is trying to coax the female to eat a chunk of raw meat cut from the still-living Patriarch. The children are also there, one is puking on the floor while the other two cry or sit stunned respectively. 6- Outside: Someone who looks disturbingly like one of the player characters. Inside: That same person being crucified beneath a stone sky. This hall has three doors, one that leads back to "24", one on the right-hand wall, leading to "26" and at the end on the left-hand side, leading to "18". This hall is covered in decorations, mostly paintings but also small platforms displaying important items. Most of these items are small and seemingly insignificant, as if they were selected for sentimental reasons and not any other. There are also small plaques set next to each one, to further explain what is depicted. Roll on the table below to see what the painting/item you're looking at signifies. 1- A broken sword, a golden diadem that was snapped in two, and a pristine skull. The plaque reads as follows: "The Battle of Milzo was decisively decided when Lord Tsychiak ambushed the King of the Olijorans by shapeshifting into a fly and landing on his horse, before transforming back and attacking him. King Nerrik perished there, on the battlefield. His army was soon routed and fled the field." 2- A flower-crown of tiger lilies in a glass case. The plaque reads as follows: "The Battle of Jungle Gate ended in defeat for the Handsome Men of the Nahan Confederacy after Lord Carpathi successfully tricked them into chasing his fleeing troops. However, it was no true retreat, merely a deception, and as their troops broke ranks, they were crushed by his calvary. As a sign of their friendship, the Nahanian Handsome Men offered these flowers, enchanted with their power to never fade or die, not until this pact between us is broken." 3- A dozens swords partially melted together into a unusable lump of steel. The plaque reads as follows: "The Battle of the Barley Fields ended when Lord Carpathi lured his enemy, the united armies of the Five Western Kings, into a great field of dry barley stalks. He then set the field afire and arranged his infantry to prevent his enemies from escaping. The flames swept through the dry fields and almost fifty thousand men died, either being burned alive or attempting to escape and being cut down by our Lord's infantry. 4- A pair of eyeballs in a glass tube. The tube looks quite similar to the glass coffins in "22". The plaque reads as follows: "Tychis was a city under the dominion of the Noble Cloud-Lords, who treated ehr with respect and care. Tragically, Tychis rebelled, breaking the covenant between her and the Cloud-Lords. Thus, Lord Carpathi and Lady Juliko rode out to administer justice. For three weeks they besieged the city, until Lord Carpathi himself managed to breach the city walls and bring them tumbling down. After that, his army spilled into the city and brought down the sword of judgement upon these traitors and criminals, as per Lady Juliko's orders. After that, Lady Juliko set up her Court and tried many of the city's governors. She found the eyes of this man, a servant of one of the City's Elders, guilty, and demanded they be removed. They were, but Lord Carpathi ordered them preserved, along with the eye's owner, in a gesture of supreme mercy and divine benevolence." This is an elegant ballroom, a vast, tile floor flanked by glass windows on all sides, and large french doors of glass leading out onto a veranda. This veranda has paths that lead down to Zone 3. There is also a large staircase leading up at the edge of the ballroom, leading to a beautiful balcony that overlooks the whole area, and a shut door which would lead to the second floor of the palace. However, the ballroom has endured severe abuse in the years since it once hosted the aristocracy of a hundred nations. Now the glass is all shattered and the great chandelier that once dangled from the ceiling has crashed down onto the ground, leaving a pile of shattered crystal on the ground. There are also two fat candles standing at either side of the staircase leading up. They are both made of black wax, squat and fat as fireplugs, their wicks made of rope big and sturdy enough to restrain a horse. The candles burn with cold, black flames that sap the heat of anything near them. Additionally, touching the candle makes one's heart beat faster and all the hairs on your body stand on end, as you suddenly feel the shadow of death falling over you. These candles cannot be extinguished for any reason. They are linked to the Black Despoiler and to his Black Fountain respectively. If the Black Fountain falls under someone else's control, one of the candles will go out. If the Despoiler is freed from his shackles, the second will go out. There is also one other thing in this room. Two Sleepless are hiding behind the door to the upstairs balcony. If you come into this room, they will talk to you, but they won't let you onto the third floor, unless you somehow convince them that you are actually one of the Guardians, responsible for keeping the Forsaken trapped in here. Also, if you get chased in here by some Child-Soldiers, the Sleepless will come out of the door and take shots at the Child-Soldiers will their javelins.